The Shambles is one of the oldest areas in Stroud. On the right is the Old Town Hall which dates from the late 1500s, the market stalls used to be housed in the arches under the Hall. John Wesley the founder of the Methodist Church preached from the butcher's blocks outside the Church Hall on the left on 26th June 1742. There is a Blue Plaque to commemorate the event. At the end of the Shambles are the double gates leading to St Laurence Church. There was a chapel here in Saxon times. 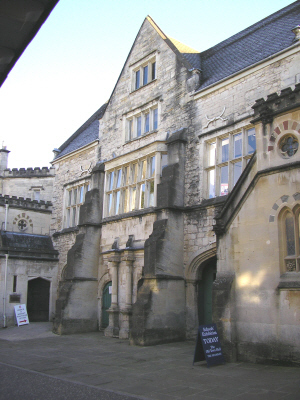 Stroud became its own parish, separate from Bisley in 1304. The Church was rebuilt in the mid 1860's, the only remaining part of the original building is the Church Tower with its spire. There are a series of History Boards which give more information on all these buildings, and also take you around the town pointing out other historical and interesting parts of Stroud. "Shambles" means - "Butchers stalls, a Meat-Market" and there has been a market here for centuries in one form or another. The original market benches can still be seen against the wall on the left, as you go into the Shambles. They were originally further down but have been moved here to preserve them. The Shambles is a wonderfully atmospheric place to visit at any time, but on market days it is transformed into a thriving, busy area that could be timeless.